Weekend by Special Arrangement Only! Our hygienist plays a vital role in your oral health care routine, and can make a huge difference in our on-going efforts to keep your teeth for life. Our emergency dentist will do their best to provide same day care. When you arrive at our modern and inviting dental clinic, you'll notice we do things differently. 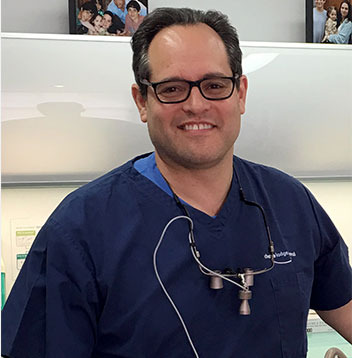 Run by our highly regarded dentist, Dr. Mark Becker, we offer our patients the best of both worlds - a quality of care with affordable prices and payment plans that fit your budget. At our dental surgery, we consistently achieve long lasting, beautiful smiles with superior dental techniques and emerging technologies. We respect you as an individual with unique needs, desires and concerns – dental and emotional. Simply put: when you visit us, we listen to you. It's our priority to understand your goals and fulfill them with kindness, efficiency, and precision. Your Mill Hill dentist won't ever keep you in the dark. You'll be fully involved in decisions about your care and health, and we’ll keep you informed at every stage of your treatment. Our talented and skilled dentist are passionate about patient education and preventing problems, rather than treating them as they occur. Preventative care creates a more enjoyable and affordable experience - we trust you agree! When problems do arise we use effective and minimally invasive treatments to bring you back to excellent dental health.